Anna Ahlström was an entrepreneur and a school founder. In 1902 she founded Nya elementarskolan för flickor (New Elementary School for Girls), which also became known as the Ahlström school. Anna Ahlström grew up in Stockholm as the second child in a family of four. Both of her parents came from simple backgrounds. However, her father, Johan Ahlström, had obtained a basic level of training and education due to improved education opportunities for the poor and his aptitude for study. He was also a building contractor and had an architect’s vocational certificate. The family’s economic security and the fact that Anna Ahlström was born at a time of increased opportunities for women to obtain higher education meant that Anna Ahlström herself received a solid education. She attended nine years of foundational school at the Institute des Langues Modernes in Stockholm and then continued her studies at the Wallin school, the oldest school for girls in Sweden, from which she graduated in 1885. At that point she was 22 years old. During the following four years she deepened her knowledge of, in particular, languages and other humanities at various universities, mainly in France but also in Great Britain and Germany. 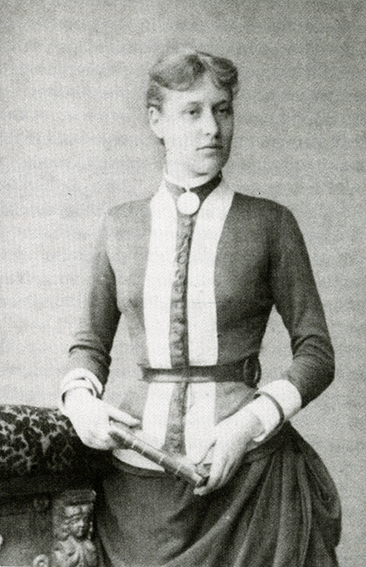 Upon returning to Sweden Anna Ahlström enrolled at Uppsala University to continue her studies whilst teaching French at various girls’ schools in the Stockholm area. She gained her first degree in 1891 and in 1899 she became the fifth woman to receive a doctorate at Uppsala University, defending a thesis entitled “Sur la langue de Flaubert”. At the time the labour market was characterized by gender discrimination for women with doctorates and those who did succeed endured harsh conditions if they gained high-ranking positions. Elsa Eschelsson’s experience as senior lecturer in procedural law is a revealing example. Anna Ahlström took her first steps toward a career within the sphere of girls’ schools. Following her doctorate, she completed a year of practical teacher training at the Norra Latin school in Stockholm. She received excellent recommendations and subsequently taught at various schools in Stockholm. After her successful probationary year she applied for a position as senior teacher but was rejected on the grounds that she was a woman. At the turn of the twentieth century the educational authorities not only discriminated against female academics with regard to positions within academia, they also rejected female applications to positions in teacher training colleges. Anna Ahlström and other academically qualified women strongly criticised this type of employment discrimination. Their struggle for equal status included a 1903 petition highlighting the discrimination evident in the educational authority committee’s decision of 1902. The petition was signed by 93 female academics with Anna Ahlström as one of the prime instigators. When it became apparent that becoming employed as a female senior teacher would not become possible for many years, she took matters into her own hands and established her own school in 1902. An example of Anna Ahlström’s determination emerges in the literature written about her: after being denied loans by not only banks but also her own family, she turned directly to a known financier. When asked what guarantees she could provide, she answered, “guarantees, I can write my own name - legibly!”. This reply led to the provision of a loan. Nya elementarskolan för flickor, or the Ahlström school, as it came to be known locally, was a small-scale operation for the first five years of its existence. However, the school quickly earned a good reputation and Anna Ahlström very cleverly managed its finances. When marking the centenary of Anna Ahlström’s thesis defence, Kerstin Stark, a former pupil and teacher at the school, described Anna Ahlström as an intelligent, clear-headed woman with great civil courage. These attributes are evident in her correspondence with the authorities and provide an explanation for the school’s advanced position and for why it persisted significantly longer than many of the girls’ and co-educational schools established by women in the late 1800s and early 1900s. After the school had been up and running for five years, Ellen Terserus was hired. She came to play a very meaningful role, both for the school and in Anna Ahlström’s private life. Ellen Terserus was appointed deputy head within two years of becoming employed and after another two years “Ahlan” and “Tersan” (as they were known by the teachers and students) began living together. They remained together for more than 30 years. The same year that Ellen Terserus was hired, the Ahlström school also received state aid and moved to larger premises. The number of students quickly rose to more than 100. Not long after 1910 Anna Ahlström began to make plans to build a new and grand school but these plans were delayed when the First World War broke out. Nevertheless, in 1926 the new school premises were completed and 500 students were enrolled. The new building, located in Östermalm, not only allowed for a total capacity of almost 1000 students but it was also remarkable for its magnificence: it was a seven-storey building fronted by six large columns. Anna Ahlström’s successful entrepreneurial talents shone in her ability to obtain funds for the new school. In 1930 both Anna Ahlström and Ellen Terserus, 67 and 63 years old respectively, retired. Although a new director of studies and head of school were hired both women actually remained in charge of running the school just as before. At this time many of the schools which had been established around the turn of the century were becoming municipalised or were simply shut down. In 1937 a proposal was made to re-organize six municipal girls’ schools. In contrast to many of the other independently established schools, Anna Ahlström’s school continued to run during this period of educational reform. She successfully argued that her school should remain a separate girls’ school and even be awarded financial funding from the state. During the 1930s Anna Ahlström and Ellen Terserus set up the Anna Ahlström and Ellen Terserus Foundation which, from 1944, owned and administered the school. Anna Ahlström died on 12 October 1943, barely three weeks after Ellen Terserus had passed away. By then she had run, worked at and developed Nya elementarskolan för flickor for over 40 years. In accordance with her will all her papers which were not official documents were destroyed. Anna Sofia Charlotta Ahlström, www.skbl.se/sv/artikel/AnnaAhlstrom, Svenskt kvinnobiografiskt lexikon (article by Emil Marklund), retrieved 2019-04-24.